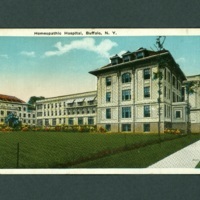 This postcard features a rendering of one of Buffalo's two homeopathic hospitals, this one located between Lafayette and Linwood Avenues in Buffalo, New York. 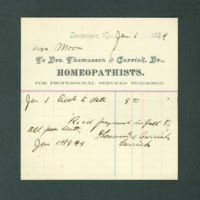 This handwritten bill on practicioner's letterhead is for receipt of payment from a patient. 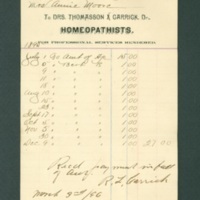 This handwritten bill on practicioner's letterhead is for a prescription written for several months. 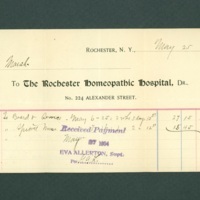 Handwritten on hospital letterhead, this bill was written for "room and service" for a number of days. 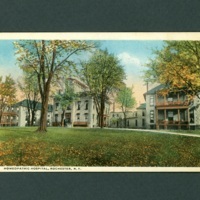 This postcard depicts a rendering of the homeopathic hospital in Rochester, New York, after it was moved to 224 Alexander Street in 1894.